We are happy to send some late summer cheer your way courtesy of our new sponsor, Arm & Hammer. One lucky Cat Wisdom 101 reader will win a 14 lb box of ARM & HAMMER® DOUBLE DUTY Advanced Control Cat Litter and a $100.00 Visa Card. Like millions of others, I grew up with the familiar orange box of ARM & HAMMER® Baking Soda. My mother kept a box in our fridge and another in the pantry. It had so many uses, I naturally kept up the tradition when I moved into my own home. Growing up, we always had pets and back then, forty years ago, before clumping litter, we sprinkled baking soda to absorb litter box odors. Needless to say we were thrilled when ARM & HAMMER® developed the first cat litter with baking soda about 30 years ago. They’ve been improving and tweaking their formulas ever since. Ragweed season is here and to keep my nose clear I like using a saline rinse in a neti pot. 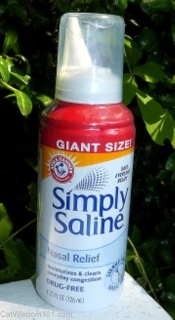 I was delighted to find in the box of goodies Arm & Hammer sent us, a bottle of Simply Saline. It’s the same principle as using a neti pot but in a convenient “take anywhere” canister.Simply Saline™ is an all-natural way to clear nasal congestion quickly. It’s simply purified water and 0.9% salt and easily cleans dust, dirt and pollen from nasal and sinus passages without fuss or habit-forming chemicals. Simply leave a comment. For extra chances to win, share this post on social media i.e. Facebook, Twitter, Pinterest, Google+, Newsvine, etc. AND/OR are a Cat Wisdom 101 subscriber or follow us on Facebook, Twitter, Google + or Pinterest. Please leave a separate comment mentioning where you shared. Our social media link buttons are located both at the top and bottom of the page. This giveaway is on until 11:59 pm EST September, 5, 2013. This giveaway is open to US residents 18 years of age and older. The winner will be chosen randomly and will be announced on Sept.6, 2013. The winner will be contacted by email and will have 72 hours to contact us to claim their prize and supply their shipping address and another winner will be selected. NOTE: We will be taking the day off this Friday and not be doing our usual Friday giveaway. Our Feliway giveaway is extended by one day and the winner will be announced this Saturday. Disclosure: We received an assortment of ARM & HAMMER® and other product samples plus a sponsor fee. None influenced our opinions which remain 100 % our own. We Use Arm & Hammer for everything! I love the fact that my cat litter box never smells when I use our product and recommend it to everyone! I just Tweet to all my friends. So I am hoping they will see my post to enter. I love Arm & Hammer Products. I am disabled & this sweeps sure would help me out a lot. Good Luck to All! I just shared on Facebook about this great Giveaway. I didn’t know that Arm snf Hammer had products to down oders from litter boxes. That is so cool! 🙂 Thanks for hosting this giveaway! I follow Cat Wisdom 101 on Facebook and get email alerts about new blog posts too. I shared this contest on my facebook page for an extra entry to this giveaway. Thanks! I would like one entry for the Arm and Hammer litter giveaway please and thanks! Arm & Hammer litter is all we use! What a great prize! $100 sure can buy a lot of cat nip! Thanks! We shared on our GLOGIRLY Facebook Page! We subscribe to Cat Wisdom via email! Glogirly’s mom always had baking soda in the fridge too! Thanks for this great giveaway. I follow you on Facebook. i love arm and hammer products, esp their toothpaste! Arm & Hammer makes the best kitty litter – you can’t even tell I have a cat by smell! We love Arm & Hammer Baking soda; great for keeping the fridge odor free. I use their baking soda and would love to try the litter. My kitty would love to try the litter! I have two kitties, so definitely like trying out different brands of litter for them. i definitely can use this, my kitty needs litter after all, thanks for the opportunity! I have two huge boxes of their litter in my laundry room right now! I did realize that Arm & Hammer makes Simply Saline. We use it every winter. I’d love to try this litter with Samantha, I’m sure it’s great for odor minimizing! Thank you so much for such an awesome giveaway! I really appreciate and good luck to everyone! Would love this for our kittys to buy them some pet food and treats, thank you. I love Arm & Hammer, thank you for the giveaway! LOVE Arm & Hammer! We have three cats and two new kittens – so this would be super useful!! Follow you on Twitter, tweet my crew! Liked, follow you on facebook! We can ALWAYS use some extra Arm & Hammer! We love Arm and Hammer products! Use them throughout the house to keep everything fresh and clean. Thanks for the giveaway! shared on Facebook, Twitter, Google + and Pinterest. Hi, I really do use these products, as I now have three cats. The latest, little Milo, 12 weeks old. I can’t wait for halloween, he is solid black. 🙂 I also use baking soda on my carpets to remove pet odors and fleas. I use natural products, safer a lot more cost effective. I follow you on twitter, FB and your blog. AND we’re FB & twitter followers! Please enter us in the drawing. Thunder would like to give it a try. What a great bunch of products! thanks for hosting the giveaway. I follow you on Google+. I follow you on Twitter as @whitsweeps. I follow you on Pinterest as Whitney Lindeman. Great giveaway – thanks so much for the chance! Love Arm & Hammer products! What an AMAZZZZING giveaway. I hope to win this one!!! I follow on google + as deeg131. Like you we always had a box in the fridge and the freezer and we used it in baking and washing and brushing teeth and on and on……….I would love to try to Simply Saline. Would be a great help to my fall allergies! But a box of litter and a VISA card would be good too. Thanks for the chance! Thanks for the chance! This is an awesome giveaway! I follow you on Pinterest where I am Margot Core. Nice! This is a great giveaway! Thanks Layla and thanks Arm & Hammer! hey layla frankie wants to try some new litter so count us in too. I havent tried this litter yet, but my kitten is getting picky about her box, so maybe Ill give this a try! What a great giveaway! We’d love to be entered. 🙂 Thanks, pals! I love this litter as do my girls. It doesn’t track as much as other litters and the unscented version really doesn’t have a smell yet controls odors wonderfully. Count us in the drawing. How pawsome of a giveaway! I shared this contest on my facebook page. We actually use Arm and Hammer and love it. Some FREE Arm and Hammer litter would be really pawsome! Thanks! Arm & Hammer Cat Litter!!! We’d love to win (the cats and the foster)! I started using their litter a few months ago and I really like it. I can ALWAYS use litter and a hundred bucks on top makes it all that much better. I don’t want to win the litter but want to win the gift card so I guess I’ll donate the litter. TW swears by Simply Saline cos Nutti Pots are dangerous if you use tap water and its got something in it. We’re a rescue household so litter is always in need! How great! 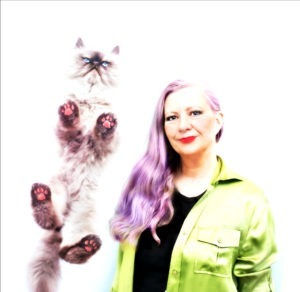 – Now for a bit of truth telling; in spite of being a devoted kitty mom of two I am in fact allergic to cat dander! It’s not to bad, but I do have to wash out my nose with saline. I’ve never seen this brand but will try it. I was not aware Arm & Hammer makes kitty litter. We so don’t do well with change but that is a super cool giveaway! I’m leavin’ a comment but don’t enter me in the contest. I’d like to be entered but you know… I’m a Canadian kitty so I can’t. Just wanted to say though that the peep uses that stuff in the laundry all the time. She likes it a lot, I think. I, myself, don’t use it. I use spit and polish… bein’ a cat and all. Fabulous giveaway! Thanks for the chance to win! We’d love to win this. This litter would work well for my cat. Thanks! I follow you on Google + as Mary F.
Great prize! Thanks for the chance! Would love to win! This litter is a good one! Amazing giveaway! We’d love to enter! What a great giveaway! We love Arm & Hammer products! Mom swears by them. Oh please enter us! While we may not use this litter, we’ll make sure we donate it to our local shelter. We know they can use all the litter they can get! That is a great giveaway for some lucky kitty. My mum uses Arm and Hammer baking soda for all sorts of different things too. Arm & Hammer makes saline now? How interesting. We’d like to enter, please. What a generous sponsor! I’d like to enter this! I’ll donate both the litter and gift card if I win. Aww, I wish we had this out here!